← What Do You Do When You Receive Your Renewal Notice? When deciding on the level of car insurance you will need to chose either third party, third party fire and theft or fully comprehensive cover. However, another major decision that will affect the premium is the class of insurance i.e. what will you be going to use the car for. 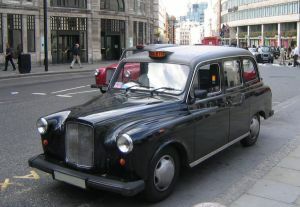 You couldn't just insure a London taxi for social, domestic and pleasure purposes! The reason for this is that the insurance company believes that someone using a car for business purposes is more likely to be involved in an accident than someone who merely drives the vehicle for social purposes and this is reflected in the premium that they charge. Of course, if you use your car for business purposes and travel 30,000 miles each year in it you may argue that you are a better driver than someone who only uses the car to go to the local shop. That is not how a car insurance provider views the situation. This class of cover allows you to drive your car purely for social, domestic and pleasure purposes such as going to the shops or visiting family. It does not cover you for commuting to and from work. In addition to what is covered for social, domestic and pleasure you are also covered for commuting to where you work on a permanent basis and the return journey. If you drive to your local railway station, park your car at the station and then make the rest of the journey by train that is also classed as commuting. If you use your car to travel to different work locations you will need to be insured under the above class of insurance. There are other business use classes and other more specialist classes of car insurance such as if you drive a taxi but, hopefully, the above is of assistance to you and enables you to make the correct car insurance class selection.